Non enveloped, bacilliform particles, 30 nm in width and 90-900 nm long. Monopartite, open circular, double stranded DNA of about 7200 base pairs with discontinuities in both strands: one in the transcribed strand and one to three in the non-transcribed strand. ORF1 polyprotein is presumably cleaved into several chains by viral protease. 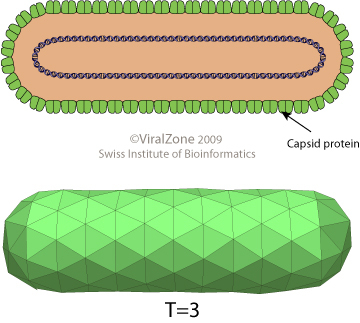 Attachement of the viral proteins to host receptors mediates its entry into the host cell. GEOGRAPHY CSSV: Western African sub-region in the countries of C?te d’Ivoire, Ghana, Togo and Nigeria. ASSOCIATED DISEASES CSSV: leaf chlorosis, root necrosis, red vein banding in young leaves, small mottled pods, and stem/root swelling followed by die-back. Infection decreases yield by 25% within one year, 50% within two years and usually kills trees within 3-4 years. TRANSMISSION CSSV: vector= mealybugs. Can also be mechanically transmitted through wounds and by seed.